This news will come as no surprise to College Insurrection readers, but see the chart below. Christopher White writes at The College Fix. Universities have experienced a dramatic spike in the rate at which campus guest lecture and commencement speaker invitations are jettisoned because some students and faculty don’t like what the speakers have said or done in the past. The Foundation for Individual Rights in Education on Wednesday released a report which found that since 2000, there have been at least 192 reports of disinvitation incidents involving campus speakers, including campus speeches, commencement ceremonies, and other events. 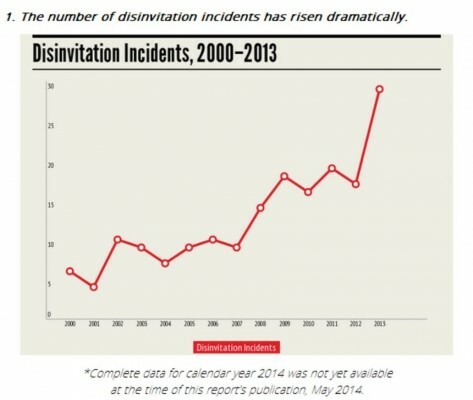 “The data demonstrates an upward trend in the frequency of disinvitation attempts, with a sharp rise beginning in 2007 and peaking in 2013 with 29 incidents,” FIRE stated. Nevermind open dialogue and tolerance for other viewpoints – all that idealism is tossed out like yesterday’s garbage when some students and professors don’t like the speakers or topics. 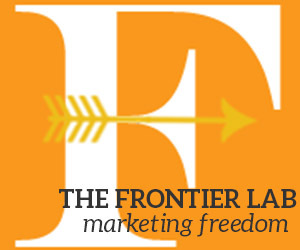 What’s more, administrators – and all too often the invited speakers themselves – kowtow to the pressure, either disinviting the guest or bowing out of the honor. The trend, says FIRE President Greg Lukianoff, is happening because colleges are more willing now than ever to turn their backs on speakers. Others also blame the Millennial culture for the trend. In a world where college students demand “trigger warnings” before professors cover possibly upsetting material; where the word “selfies” was added to the dictionary because young people can’t stop taking pictures of themselves and posting them on the Internet; where viewpoint discrimination runs rampant on college campuses so students don’t have to hear opposing ideas – that is the world that has fostered this latest and disturbing trend, they argue. Oh just cancel graduations entirely and mail out the diplomas. It has become a useless exercise anyway. hand them out as they leave their last class.